It appears that today some cards were printed using last week’s format – blue course and stroke. This error was in no way associated with the new software program and was due to human error. It was corrected later in the day. All members were very understanding of this and played their stableford round with 2 Ball best ball in conjunction as planned. The error did not effect the competition in any other way and made no difference to results. For members’ information all competitions are preset 2 months in advance in the office and checked to ensure that they are correctly registered. The system is new and mistakes will be made occasionally while we all become familiar with the system especially in reading two concurrent competitions with ‘Just Bathrooms’ in the title. The match committee thanks members for their kind consideration and understanding. While talking about today’s competition, won by Bernie McGlinchey and Ron Chilby with 46 points, it was apparent that quite a few members failed to pick a partner and enter a fourball score into the computer at the conclusion of their rounds. The process is quite simple, enter the first team member’s score and save it (hit F2). The computer then calculates a list of available players to act as your partner. Choose and click on the one with an asterisk and look at the screen. Use the mouse to click “TEAM US”. Then enter the second players score and save. That’s all you have to do. Look on the screen and it shows you what to do. If there is only three in your group don’t enter the third score. Keep the card separate and give it to the office. The match committee will enter your card and arrange another card for you to team with from the other single players. Don’t forget that every time you play a Just Bathrooms 2 Ball event there is a prize for the first and second places each day. These are $35 each for first and $25 each for second. Just because you are not a chance to win the Just Bathrooms Cup doesn’t matter. There are the prizes for each day to be won, just like Bernie & Ron and Alan & Luke did today! The names for each two person team will be printed on your card this Saturday. Also the starter will hand write a big ‘P’ or ‘C’ on the top of your card to show you which team you are representing. The team with the greatest aggregate number of points will be declared the winner and enjoy bragging rights until the next playing of the annual event. Don’t be afraid to remind your opponents of how they are playing during the round – clever sledging is encouraged. At the conclusion of your round don’t enter your score into the computer, just put the cards in the box. There will be a prize for the best overall, best President team score and best Captain’s team score as well as runner’s up in each team. A “lowest team score’ prize will also be awarded. For those who are not sure here is an example of how to show your score on the card. It is a ‘best ball’ and only the best score for each hole needs to be shown. A busy time is ahead of us in the next couple of weeks with several important Honour Board events taking place. The Mixed Foursomes Championship will be held at the club on Sunday 28th of April. The event will be contested over 27 holes with the Ladies having the honour on the first tee. Players will play in groups of sixes with all players to be at the course from 9 am. The time sheet on ‘slice’ only allows for groups of fours so please be ready to play at a slightly earlier time than shown. We have space for more teams and it is not to late to enter. Two male members are still requesting partners if anybody is interested, please contact the golf shop. Entry fee is $30 per team and there will be trophies for best gross and best nett scores. In the event of a tie for the gross a sudden death play-off will be used using the 1st hole and then the 18th in turn until a winner is determined. Defending Champions Marie Farrant and Pat Paris are expecting strong challenges from the other highly regarded teams who are playing. It should be a very interesting day. Good luck and play well to all teams. Each year at this time a special fourball event is played with members in their pairs either representing the President or the Captain. In each group of 4 one pair will be representing the President and the other pair the Captain. A big ‘P’ or ‘C’ will be hand written by the starter on your card to designate which team you will be representing. The team with the greatest overall tally will be declared the champions and have bragging rights for the next year. The Captain’s team currently hold that honour. Enjoy the day and have a beer after the round. The bar will be open. A beautiful week for golf was enjoyed by all with results reflecting this. With the new on-line booking system members have an 8 day booking window. Most members are accessing the system at home on their desktop, laptop, tablet or phone. Some members are accessing the system by using the golf-shop computer near the door as they do not have a computer to work with at home. This is of course perfectly all right. Others are ringing the golf shop to make their booking. Again perfectly all right. Unfortunately some members are trying to rort the system by making a booking outside the 8 day window by using the computer inside the golf-shop with its calendar function. This feature is just for staff to accept social bookings that are often made 12 months in advance. If any competition bookings outside of the 8 day window are noticed by the match committee then they will be erased. All members should have the same opportunity to make a booking. Those members who prepay for a tee time are exempt as the office will post the booking for you. For Ladies and Mens’ Veterans competitions a separate booking sheet will be available as these rounds fall outside the booking window. There are a number of fourball events in April and I would like to remind you of how to enter scores for these events. Firstly enter the individual score on each hole for the first player in the team. When complete press the F2 button (save button). A list of available players will then be placed on the screen. Choose your partner and press F2. This partner should be the person next to you on the entry page. Enter the second players scores as usual and press F2 to save. Your team score will be calculated instantly and displayed for a short time on the screen. If you are worried about making a mistake then ask for help before you start entering the second players scores. It is new and we are all learning so don’t be afraid to ask for help. If you have access to the Our Golf App (the one you use to make a booking) on your personal computing device then you can also see leaderboards. It is one of the icons at the bottom of the screen. Click it and you can see any leaderboard that is available. On some days you will notice two. One will be the individual leaderboard and one will be the fourball leaderboard. The course was playing long and difficult so this week’s winners have done particularly well. Congratulations. The Jedi Knights fought heroically to the dying seconds against a stronger opposition, who were using the latest Star Fighter Technology with more fire power. Skywalker was wounded early, but the tactical strategy by SL1 to switch Obi and Jinn in the batting order confused the resistance as they were looking for an inverted yield curve and vapour trails from the wrong direction allowing both Obi and Jinn to score early victories. EP and Kassie had been in the Dark Force Star Cruiser for 80 hours and Kassie the Wonder Dog was getting frisky seeking an interplanetary tree to rub against forcing an early landing to recover hence missing most of the action and drama which unfolded. Mace Windu was able to use the Force to give detailed readings of the movements of the opposition as he wandered over the battle field. Jango was well on top of his opposition until a hole in one gave the Resistance some hope, but Jango brushed off this rare feat as a lucky hit and continued to place pressure on his younger rival who eventually knew he needed 3 holes in one on the par 5’s to win. Yoda’s compliance to combat mission was text book, receiving the praise of SL1 using the solar winds to his advantage creating tactical allocation to his portfolio which received the rare praise of the Royal Galaxy Commission. R2D2 fought like 10 Jedi Knights at one stage, the last of the Star Fighters with some capacity left to outwit and maneuver the Resistance who were reinforcing their star fighter fleet with fresh clones. Despite leading at the end of regulation play 3.5 to 2.5, one match was square after 18 and the players, according to the rules for the final series matches, had to play on until there was a result in that match. 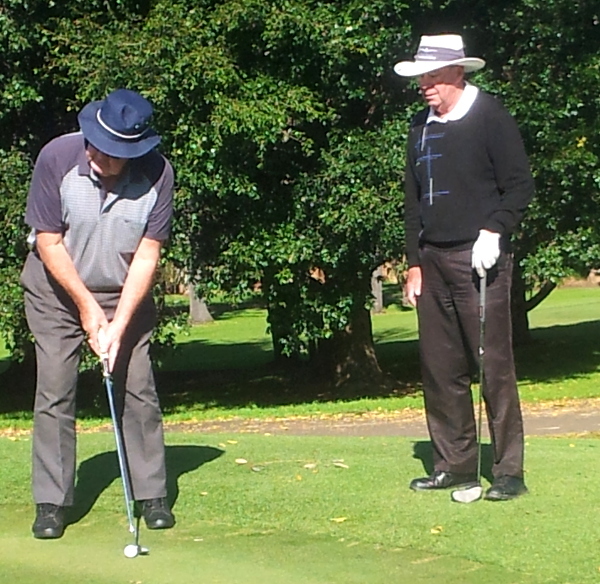 It went to the 21st hole for the Gibraltar player to register a win over Jamberoo’s Brian Nicoll. This meant that the number 1 players had to go out again to decide the winner. Pat Paris had just defeated his Gibraltar opponent in regulation play but the Gibraltar player now had a distinct advantage being off a 1 handicap and sadly for our team was successful in defeating the brave Pat. Commiserations to our team who battled hard throughout the whole season to make their 5th finals appearance in a row. The club is very proud of our Cowpats.